Small to medium-sized enterprises (SMEs) have welcomed a new approach to the development of wellbeing at work initiatives, reports Duncan Stephenson. In March 2011, the Department of Health launched the “Responsibility Deal”. This is a voluntary agreement involving more than 150 organisations from the private, public and voluntary sectors. Primarily, the Responsibility Deal consists of pledges that member organisations can sign up to, to tackle big public health issues. There are “Responsibility Networks” across four areas: obesity, alcohol, physical activity and health and work. The majority of Responsibility Network members are larger organisations and while their involvement is important, we know that as far as health and work is concerned, more than 99% of companies in the UK today are SMEs. These businesses, which employ fewer than 250 employees, often do not have the time, budget or resources to develop workplace wellness initiatives. Indeed, research commissioned by Central YMCA, a London-based health and education charity, supports this. But it has also found that employees believe that their employers could and should do more to encourage them to be healthier. The health and work agenda is not simply altruistic. While it is important that employees have good overall health and wellbeing, there is also a well-established business case. The often-quoted statistic is that for every pound spent on employee wellbeing initiatives, employers make a three-fold return through improved productivity and reduced absenteeism or presenteeism from their workforce. According to the CBI, sickness absence can cost around £495 per employee per year, which can be a particularly high cost for SMEs, and preliminary evidence in the UK has suggested that presenteeism could cost UK employers two to seven times more than absenteeism. Research from Central YMCA indicates that nearly half of employees reported that they were more productive at work if they exercise regularly. It is associated with reduced risk of depression, increased self-esteem and reduced physiological reactions to stress, as well as being an effective treatment for existing depression (Department of Health, 2009). However, the difference is striking between the level of health and wellbeing provision made available to workers in SMEs and larger companies. For almost all workplace wellness initiatives on offer, people working in larger companies are far more likely to agree that their employer makes provision compared with people who work for an SME. For example, more than a quarter of workers in larger companies say that their employer provides subsidised access to a gym or leisure centre, compared with just 8% of SME employees. Last year the Government funded a number of projects across the country aimed at promoting physical activity to employees who work for SMEs. The Health Work and Wellbeing Challenge Fund supported a number of projects including “Workplace Activator”, an approach developed by Central YMCA and evaluated by the University of Westminster. At the heart of Workplace Activator is a peer-support model. It is based on recognition that people are more likely to respond positively if their work colleague or friend is encouraging them to make changes to their behaviour than if it were a stranger or a health professional. The Workplace Activator approach asks companies to recruit volunteers from their existing workforce who are good communicators, confident and interested in and committed to physical activity. They receive training to become the nominated physical activity champion for their employer. As a Workplace Activator they will gently “nudge” their work colleagues to be more active – signposting them to activity opportunities, accompanying them to exercise classes (if required) and even organising company-wide challenges. For companies that took part in the Workplace Activator pilot, participating employees also received free or subsidised membership to local fitness facilities, access to dedicated exercise classes and online mentoring and support. The Workplace Activator programme was piloted in 2010 across 17 SMEs in Central London, including “Time Out”, the National Housing Federation and Coram. Duncan Stephenson, the head of policy and campaigns at Central YMCA who oversaw the pilot, says: “Inequalities persist between what larger companies can do and what SMEs are able to offer their employees. The Workplace Activator approach has been devised as a way of narrowing this gap. 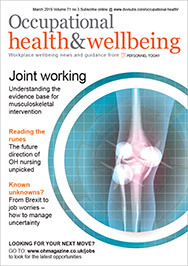 Preliminary findings are positive – a number of indicators show significant improvements in employee wellbeing, presenteeism, physical activity level and overall health. The Workplace Activator concept is now being rolled out nationally, starting across London. The hope is that more companies will have an activity champion in place as a way of supporting companies to deliver on the health at work agenda. If you would like more information about Workplace Activator or would like to attend a free breakfast briefing on the findings of the programme, email Duncan Stephenson or contact him on 020 7343 1729. The University of Westminster will be presenting interim findings of the programme on 6 May 2011 at the breakfast briefing at City Hall, London. For further details visit the Central YMCA website. Comres research for YMCA, 2011. PricewaterhouseCoopers report, “Building the case for wellness”, commissioned by the Department for Work and Pensions; 2008. XpertHR provides a model policy on employee wellbeing.